Now this is the Lotus I remember. Thread: Now this is the Lotus I remember. have they managed to resolve the team name issue they were experiencing to allow them the full title to match the look of the car? 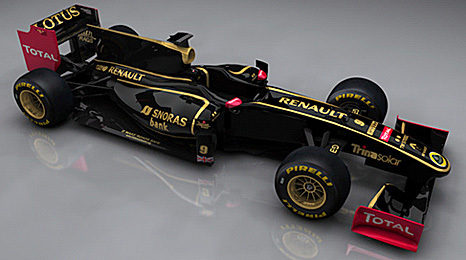 Ironically, the team are expected to abandon the Lotus name next season. this the one for next year? I think its a mock up at the moment mate. Notice the bank name on the side that at first glance looks like senna. Well having got home and properly looked I may have got the last pic all to ****. By the look of this Copy and Paste from F1.com that is actually the Renault car for next year. The Renault team are set to become known as Lotus Renault GP next season after agreeing a title-sponsorship deal with Group Lotus that will run until 2017. Following the return of the Lotus name to Formula One in 2010, under licence from Group Lotus to Lotus Racing, the announcement marks the complete return of the British sportscar manufacturer to the sport, with the full backing of parent company Proton. Group Lotus will also become major equity partners in the Renault team with current owners Genii Capital, as part of a strategic alliance between the two companies that will provide Group Lotus with significant technological and commercial opportunities for its range of road cars. Renault will continue to support the team as a supplier of engines and technological and engineering expertise. The new partnership has been enabled by French car giant Renault selling its remaining shares in the team to Genii Capital. Group Lotus will subsequently become co-owner of the team with Genii Capital. They will continue to compete with the Renault chassis name and Renault will enjoy pre-eminent brand exposure on the car. For 2011, the team plan to race in a new interpretation of the iconic black and gold colours that were last used when Lotus and Renault joined forces in the 1980s. This livery has been on the drawing board for over two months in order to reinterpret its iconic graphic signature to suit modern media requirements. Lotus Racing, Tony Fernandes’ Malaysian-backed squad that returned the Lotus name to Formula One under license this season, will continue to compete next year, switching from Cosworth to Renault power. The 2011 championship entry list published by the FIA last week listed them under the team name of Team Lotus.